Through 200 works composed for a wide range of performance genres including interdisciplinary and site-specific works, and works with and without electronics for orchestra, choir, soloists, and a variety of chamber ensembles, Orlando Jacinto Garcia has established himself as an important figure in the new music world. The distinctive character of his music has been described as “time suspended- haunting sonic explorations” – qualities he developed from his work with Morton Feldman among others. Born in Havana, Cuba in 1954, Garcia migrated to the United States in 1961 and received his DMA in Music Composition from the University of Miami in 1984. A long list of distinguished soloists, ensembles, and orchestras have presented his music at festivals and recitals in most of the major capitols of the world. Recent performances of his music include those in Poland, England, Italy, Spain, Mexico, Colombia, Cuba, and other parts of Europe, Latin America, the US, and Canada. Additional recognition for his work has come from the Rockefeller Foundation in the form of a summer residency at their Center in Bellagio, Italy during 1999 where he completed a new work for the Caracas based Simon Bolivar orchestra. The orchestra premiered the work as part of the Festival Latinoamericano de Musica held in Venezuela in the fall of 2002. A recording of the premiere was released on New Albion Records in 2004 as part of his solo CD celestial voices. Further support from the Rockefeller Foundation includes a visiting artist residency at the American Academy in Rome during the summer of 2000 where he completed a new piece for the Juilliard based Continuum Ensemble which they premiered that fall as part of their tour of Latin America and as part of the NYC Sonic Boom Festival in the fall of 2001. Garcia is also a two-time Cintas Foundation Fellowship winner (1994-95 and 1999-2000) supporting the creation of several new works for distinguished soloists and ensembles here and abroad. Other awards include a 2001 State of Florida composer’s fellowship, first prize in Mexico’s Nuevas Resonancias competition, and first prize in the Joyce Dutka Arts Foundation (JDAF) 2001 competition. As part of the prize Garcia completed a new work for cellist Maya Beiser who premiered it at the JDAF awards ceremony held in NYC that May. The work was subsequently recorded by Madeleine Shapiro and released on one of Garcia’s solo CDs Innova Recordings. His imagenes sonidos congelados for violin and fixed media was premiered at the 2000 Spring in Havana Festival, selected as part of the 2001 Sonic Circuits competition, and later performed at the 2003 ICMC in Singapore. In 2003, his work for piano and electronics for Kathleen Supove was premiered at New York University and at various concerts in the US. Another work for fixed media, temporal was presented at the 2006 ICMC in New Orleans and at the 2006 International Electro-Acoustic Music Festival in Santiago de Chile. Other performances of note include his work Auschwitz (nunca se olvidaran) for orchestra and choir, premiered in 1994 by the New World Symphony Orchestra in Miami and subsequently given its NYC premiere October 2003 by the Brooklyn Philharmonic with the Trinity Church Choir and again in 2010 with the Brooklyn Philharmonic and the NYU Singers with Arkady Leytush conducting. In 2004 and 2005 the Electronic Music Foundation and the Barton Workshop presented portrait concerts of his music in New York City and Amsterdam. Portrait concerts of his works were recently presented in Mexico, the UK, and Spain in 2014-15. Important recent premieres of his electroacoustic works include those at the International Computer Music Conference (ICMC) in New Orleans 2004, FEAMF 2005, SEAMUS Festivals 2007, 2008, 2011, 2014 and his collaborations with video artists Jacek Kolasinski, John Stuart, Daniel Viñoly, and Eric Goldemberg, which have resulted in new works premiered at the International Music Festival in Lima Peru, the Cervantino Festival in Mexico, the Spring in Havana Festival in Cuba, the Ear to the Earth Festival and the New York City New Music Festival in NYC during 2007, 2008, 2010, 2015, 2017. Garcia’s experimental video opera, transcending time, was premiered April 2009 at the Biennale in Zagreb, Croatia with the Cantus Ensemble. The work for chamber orchestra and 5 singers includes videos by Stuart and Kolasinski as well as text by MacArthur Foundation laureate poet Campbell McGrath. In December 2017 and January 2018 Garcia presented 2 site specific works commissioned by the Vizcaya Museum and Gardens. The first of the two was an interactive installation placed in the museums music room which brought the harpsichord, harp, and dulcimer to life as museum goers passed by and the second a work performed twice in the pool grotto area for string trio, wind chimes, wine glasses and fixed media created utilizing the resonant qualities of the space. Another interdisciplinary work, this time with the theme of sea level rise is being realized with the support of the Knight Foundation and Faena Art is scheduled for premiere in the spring of 2018 at the Faena Forum. The work features a collaboration with Stuart, Kolasinski, and McGrath again, this time adding choreographer Agusto Soledade to the team. Other recent premieres include Garcia’s orchestra work In Memoriam Earle Brown, premiered February 2011 by the Miami Symphony Orchestra (MISO) with conductor Eduardo Marturet and subsequently by the Simon Bolivar Orchestra at the Festival Latinoamericano de Musica held May 2016 in Caracas. Others for orchestra/chamber ensemble with soloists include el viento distante (the distant wind) for clarinet and orchestra premiered May 2012 by the Lviv Philharmonic in Katowice, Poland with soloist Wojciech Mrozek and Krzesimir Debski conducting. A string orchestra version of the work with the same ensemble and soloist was premiered August 2013 in Sandomiez, Poland and again in June 2015 with clarinetist Fernando Dominguez and the Orchestra de Bellas Artes at the Foro Internacional de Music Nueva in Mexico City and subsequently at the 25th International Review of Composers in Belgrade, Serbia in October 2016 with clarinetist Veljko Klenkovski and the Saint Georges Strings. The orchestra version was also performed by Mrozek with the Szczecin Philharmonic in Poland April 2014 with the composer conducting. A new version of his work for two contrabasses and orchestra was premiered in April 2015 by the MISO with Luis Gomez Imbert and Jeff Bradetich soloists and in September by the National Orchestra in Medellin, Colombia. In the spring of 2013 he was at the Civitella Ranieri Foundation Center in Perugia, Italy completing a work for orchestra and string quartet premiered in 2016 by the MISO and the Latin American String Quartet. In spring of 2014 he was in residence at the MacDowell Colony completing works for the Suono Sacro Ensemble in Italy and the Nuevo Ensemble de Segovia in Spain each premiered during 2014. In July, he was at the Casa Zia Lina in Italy working on a new piece for the Bugallo Williams piano duo premiered in the spring of 2015 and in August was at the Millay Colony completing works for the Chicago based Fonema Consort ensemble and a video work with visual artist Jacek Kolasinski both premiered that fall in Miami and Mexico. In the spring of 2015 he was in residence at the Bogliasco Foundation Center in Genoa, Italy completing a new work for 2 violins and orchestra and in August at the Visby International Centre for Composers completing a new work for bass clarinet and electronics for Harry Sparnaay. Other recent new works include those for violinists Jennifer Choi (violin and string orchestra) and Mari Kimura (violin and electronics) premiered in the spring of 2015 in Miami, a work for 2 guitars and string quartet premiered by the Latin American String Quartet and guitarists Jaime Marquez and Carlos Martinez in Oaxaca in the fall of 2015, Kathleen Supove (solo piano), Michael Norsworthy (clarinet and string quartet) both premiered in the spring 2016, Andrew Kozar (amplified trumpet) premiered spring 2017 in Miami and the Mexico Woodwind Quartet Fall 2017 for premiere at the Foro Internacional de Music Nueva in Mexico City. Garcia’s music is recorded on O.O. Discs, CRI (Emergency Music, eXchange Series), Albany, North/South, CRS, Capstone, Rugginenti, New Albion, Innova, VDM, CNMAS, New World, Telos, and Opus One Records. An album of his orchestra music was released in September 2014 by the Toccata Classics label with the Malaga Philharmonic Orchestra and Jose Serebrier conducting. A second CD on the same label this time featuring works for chamber orchestra and soloists with Garcia conducting was released in April of 2018. The CD features violinist Jennifer Choi, pianist Cristina Valdes, clarinetist Fernando Dominguez, and the Malaga Philharmonic. Garcia’s solo, chamber, and orchestra works have been nominated for Latin Grammys in 2009, 2010, 2011, 2015 in the best contemporary classical composition category. A dedicated teacher, he is the founder and director of the Miami Section of the International Society for Contemporary Music (ISCM) at FIU, the New Music Miami Festival, the NODUS Ensemble, and the FIU New Music Ensemble and is a resident composer for the Miami Symphony Orchestra. 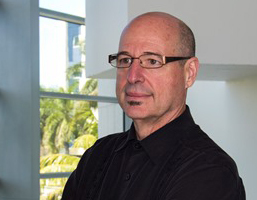 Garcia is Composer in Residence for the FIU School of Music and the CARTA Miami Beach Urban Studios and Professor of Music in the School of Music at Florida International University in Miami.